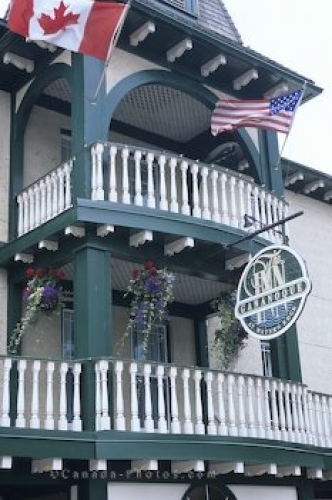 The Gananoque Inn is a historic and elegant hotel situated on the shores of the St. Lawrence River in the centre of the 1000 Islands in Gananoque, Ontario in Canada. In 1896, the Gananoque Inn first opened its doors and has changed ownerships various times over the years. It is now a very posh hotel on an amazing piece of property with a stunning view of the St. Lawrence River. The Gananoque Inn, Getaway to the 1000 Islands, Gananoque, Ontario, Canada, North America. Picture of the facade of the Gananoque Inn in Gananoque, Ontario in Canada.